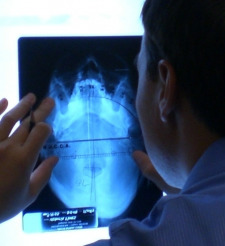 How Does Upper Cervical Chiropractic Work? If you stand in front of a mirror, close your eyes and march up and down, you will eliminate your righting reflex and see your true posture. When you open your eyes, you may be surprised at what you see. Look at your hips and shoulders. Is one side higher than the other? Is one side rotated in front of the other? Are they more forward than backward? Look at your head. Do you have "forward head syndrome," in which your chin is jutted out over your chest? Is your head rotated one direction more than the other or bent sideways to the left or to the right? It's like a car that needs to be aligned, or a building that needs to have a level foundation. A car can still run with tires that are misaligned, but one or two of the tires will wear out faster than the others and will eventually have to be replaced. A building can also stand without a level foundation, however it will be more susceptible to damage and eventually the building will fall. If you found postural imbalance, certain areas of your spine, hips, knees, ankles and feet are bearing more weight than others. These stress areas are going to break down very quickly compared to other areas of your body. For example, if your right hip is rotated forward and that hip is lower than the other, you are putting tremendous strain on the inside of the right knee, foot and ankle as well as certain areas of the lower spine. Therefore, you are very likely to have trouble or "arthritis" in those joints and discs due to progressive wear and tear. More concerning however, is the endangering pressure being put on the nerves that exit the spine that are responsible for controlling the different organs and body systems that keep us alive and functioning at an optimal level. When the Atlas bone (C-1) misaligns and gets locked into a stressed position, it forces the head to tilt towards one side. This causes the body to compensate by trying to bring itself underneath the skull as closely as possible- by twisting, shifting, and distorting the entire spinal structure in order to achieve a more 'stable' state. (see illustration above) This is a major cause of body imbalance. As the atlas is guided back into its proper position, the skull, spine, and pelvis are restored to their proper position as well. More importantly, vital healing messages from the brain can flow freely to the rest of the body, restoring function and health to the whole person. Post measurements are performed immediately after the correction to assure that the atlas is repositioning well and that body balance is being restored. To determine the exact misalignment of the Atlas, specific x-rays are taken in three dimensions to help us zero in on the precise angle necessary to correct it. 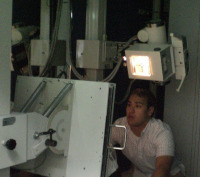 Extra time is taken when analyzing your x-rays to ensure accurate measurements. Calculations are performed based on math and physics. For the adjustment, patients lie on their side as though they are napping without turning their head or back. Correcting the atlas is done by hand. It is extremely gentle and feels like a soft massage on the side of the upper neck. The doctor will then recommend a care plan including corrective care exercises and nutritional support that best fits your particular case. You will also be encouraged to participate in advanced workshops, patient dinners, makeovers, and more to further accelerate your health and healing.